Our Milky Way workshop is held in Marfa, TX. Besides being a great historical town in the Big Bend region of Texas, it is also one of the top 5 darkest places in Texas. The darker the location the better for capturing the beauty of the Milky Way! In addition to two nights of lodging and photographing the Milky Way, this workshop also includes our Photography 101 class as well as our Lightroom Basics class. This is a very good value. We will spend much of the night hours shooting some of the most stellar views of the night sky. There will also be editing classes during the afternoons and evenings that will help you get the exact shot you are looking for. 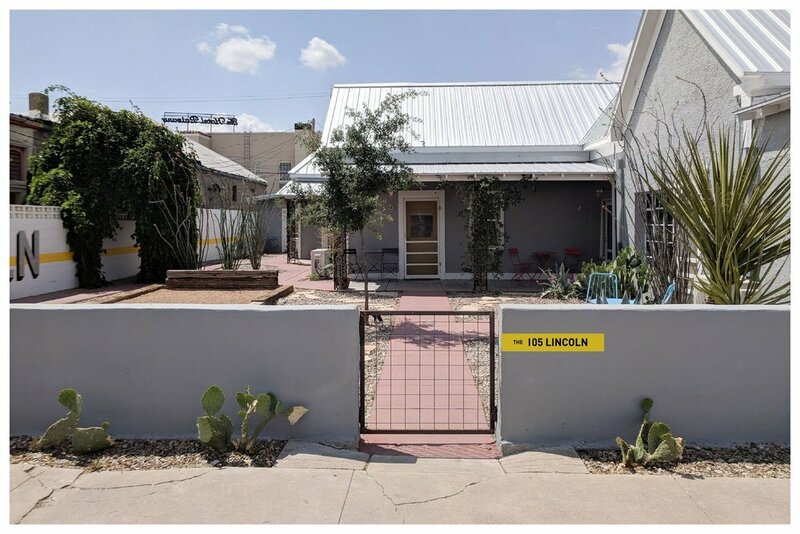 This workshop includes 2 nights of lodging at a very unique place in the heart of Marfa, TX. We will stay at The 105 Lincoln. 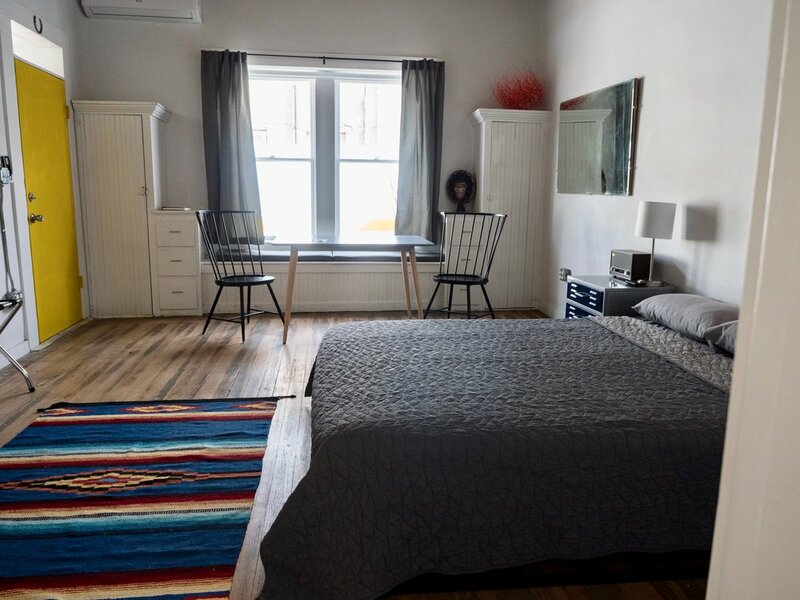 The 105 Lincoln offers a stay that is unlike any other in town, giving you all the comforts of a private home with easy walking access to everything Marfa has to offer! Each of the 11 rooms has a unique eclectic vibe, and no two rooms are alike. It even has a central courtyard with a firepit and a bocce court. We will hold our Photography 101 and Lightroom Basics classes in one of the rooms (it has a large kitchen table and plenty of room). Because of this, we think the 105Lincoln is the perfect place for the workshop. The workshop does not include meals or transportation. Light snacks and beverages will be provided during the classroom portions and while we are shooting. Below are some images of 105 Lincoln. Further below are some links for local restaurants and attractions. We will begin the workshop at 3:00. Be prepared to allow for an 8-hour drive (from Sugar Land). Just enter 105 Lincoln in your GPS. 3:00pm - in the classroom (Unit #3). After a brief meet & greet we will hold our standard Photography 101 class, including a session on the equipment, camera settings, and compositions for shooting the Milky Way later that night. 6:00pm - dinner and relaxing. We would love to see everyone eat dinner together to do a little bonding and learn about each other, but it is completely optional. 8:00pm - meet in the courtyard. Caravan out to see the Marfa Lights. The Marfa Lights are mysterious glowing orbs that appear in the desert outside the town of Marfa, and have mystified people for generations. According to eyewitnesses, the Marfa Lights appear to be roughly the size of basketballs and are varyingly described as white, blue, yellow, red or other colors. Reportedly, the Marfa Lights hover, merge, twinkle, split into two, flicker, float up into the air or dart quickly across Mitchell Flat (the area east of Marfa where they're most commonly reported). We can't go to Marfa without seeing the Marfa Lights! (They do exist. We have seen them!) Afterwards, we will begin photographing the Milky Way. 9:00am - Breakfast and free time. We would love to see everyone eat breakfast together to discuss the shoot from the night before, however, it is completely optional. You can use this time to explore Marfa and the surrounding area. 11:00am - in the classroom. We will hold our standard Lightroom Basics class, focusing on the techniques for editing the Milky Way images from the night before. 2:00pm - free time for exploring, dinner, and relaxing. 8:00pm - meet in the courtyard. Caravan out to our second location for shooting the Milky Way. Depart Marfa at your leisure. We will have breakfast at 9:00am if anyone wants to join us. Following breakfast we will hold a Lightroom "mini session" for anyone wanting to edit their pictures from the night before. A sturdy tripod with a ball head (MeFoto makes very good and affordable tripods. We recommend the RoadTrip or GlobeTrotter models. Both can be purchased in aluminum or carbon fiber. Either will be perfect for this class and your future photography needs). The essentials you’ll need right away: sunscreen, sunglasses, cash, and comfortable shoes. Marfa boasts three ATMs total, none from major banks, so get cash out in advance. Cell phone service is unreliable, though most locations offer at least one bar. Start with breakfast at the Saint George, where the smartest morning option is as old school as it is satiating: cottage cheese with salted tomatoes. Get right into what makes Marfa so special with a tour of the Chinati Foundation, a series of 15 buildings—each dedicated to one artist’s work—set in a 340-acre desert “campus” a few miles outside town. Opt for the full-day tour of the complete collection, which ranges from a building filled with Dan Flavin’s dreamy fluorescent lights to Judd’s own creation of 100 shiny steel cubes. They look identical, but each is different inside. Pop back into town for lunch at Food Shark, a Mediterranean food truck famous for its “Marfalafel” salads and wraps. (Well, it’s also known for two other things: An armada of wild 1970s cars parked around town advertising the truck, and the owners’ adjacent Late Night Museum of Electronic Wonders & Grilled Cheese, which, beginning at 9:30 each night, serves grilled cheese with a side of vintage video games). By the end of the day, with five hours of walking under your belt, you’ll be both thoroughly inspired and hungry. You're in a town with top-notch Tex Mex, so indulge in carne asada wrapped in a fresh corn tortilla at Marfa Burrito. Once sated, drive back the hotel, leave your car and walk ten minutes from the Saint George or El Cosmico to end the day with a cocktail or two at Capri. Drinks like the Mexican in Paris (a surprisingly tasty mix of tequila, champagne and lime) are served around fire pits in a pretty modernist garden. Grab your swimsuit, borrow a hotel towel and jump in the car to make the 50-minute drive on a hill-and desert-fringed road to Balmorhea State Park. The park’s centerpiece is the world's largest spring-fed swimming pool, which is somewhere between manmade and all-natural: The sides are cement, but the clear water comes from a natural spring so you’ll swim laps surrounded by turtles and catfish. Drive ten minutes east on the 3078 to pop into the picturesque Calera Chapel. The simple white stucco building is beautifully secluded, with no buildings around it for as far as the eye can see. Back in Marfa, grab a green juice and salad or hummus sandwich at Squeeze Marfa, then do some shopping. Stop into Communitie to buy a hand-woven straw hat, then go around the corner to Mano for Native American-inspired jewelry and indigo kimonos made by a former creative director of Levis. Arber, down the block, sells paintings and prints by a couple that worked with Judd from the 1970s on, and the all-white Mirth is filled with spoons, bowls, plates and even bottle openers that'll make your home more stylish. On the other side of town (we're talking a three-minute walk away) the tiny Freda stocks pottery, baskets and prints picked out by accessories designer Susannah Lipsey. Dinner is at the Saint George, where the new restaurant LaVenture serves cast-iron seared rib-eye and crispy roast chicken conceived by well-known Austin chef Allison Jenkins. Afterwards, end your last Marfa evening with a soak in one of El Cosmico’s wood-fired Dutch hot tubs. The hotel’s staff will light and stoke the fire that warms your personal tub, then keep it burning and put it out at 10 p.m. Quiet and secluded, the tubs are the perfect place to watch out for the famed Marfa Lights—signs of extraterrestrial life that are said to be frequently spotted in the skies over this peculiar West Texan town. " Workshop fees are non-refundable. We are not responsible for inclement conditions during the workshop. No refunds will be issued if the weather does not cooperate. We will check the weather forecast daily prior to the Workshop. If we need to cancel or reschedule the Workshop, your fee will be applied to the rescheduled date. Thank you for your interest in the Milky Way Workshop. We will reply to you as quickly as possible.